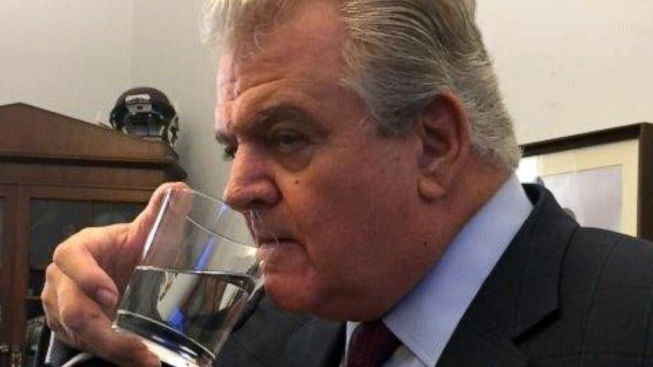 Rep. Bob Brady, D-Pennsylvania, sips from the glass that Pope Francis used during his speech to Congress. Pope Francis wasn't the only person to drink from the glass of water he used during his speech to Congress. An enterprising Democratic congressman from Philadelphia also took a sip. U.S. Rep. Bob Brady, a Catholic, told the Philadelphia Daily News that as the pope left the chamber Thursday, he headed to the lectern to grab Francis' drinking glass. Brady said he took it to his office and had a drink. So did his wife, Debra, and two staffers, he said. "How many people do you know that drank out of the same glass as the pope?" Brady asked. The congressman said he also invited fellow Catholic and Democrat U.S. Sen. Bob Casey of Pennsylvania into his office. Casey, his wife and his mother dipped their fingers into the water, Brady said. Brady said he used a bottle to save the rest for his four grandchildren and his great-granddaughter, saying he would bless them with it.